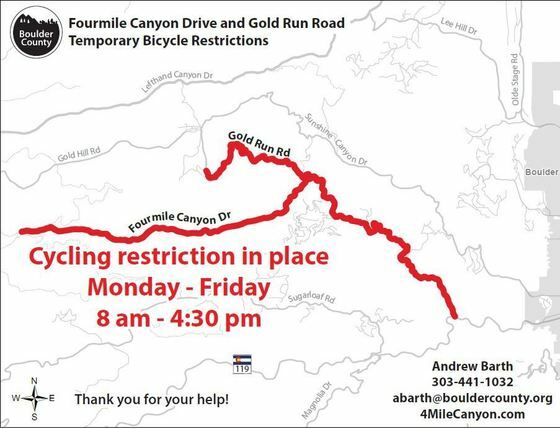 Boulder County, Colo. - Beginning at 8 a.m. on Wednesday, April 4, cycling on Fourmile Canyon Drive will be restricted between Boulder Canyon Drive/SH 119 and the Sunset townsite and also along Gold Run Road from Salina Junction to just south of Gold Hill. Cycling restrictions will be enforced during project working hours, from 8 a.m. to 4:30 p.m., Monday through Friday. Restrictions will be enforced until officials deem the area once again safe for cycling. possible, when passing, and cyclists are reminded that they are only permitted to ride two-abreast as long as they are not interfering with motorists.